Dwayne Bravo, also known, as DJ Bravo is all set to release his new song which is titled, Asia. Last month, former Pakistan captain Shahid Afridi tweeted the teaser of the song. Apart from Afridi, it featured famous cricketers from subcontinent like MS Dhoni, Virat Kohli, and Kumar Sangakkara. Bravo is an all-rounder in the true sense as besides his batting and bowling, he is known for his singing abilities as well. 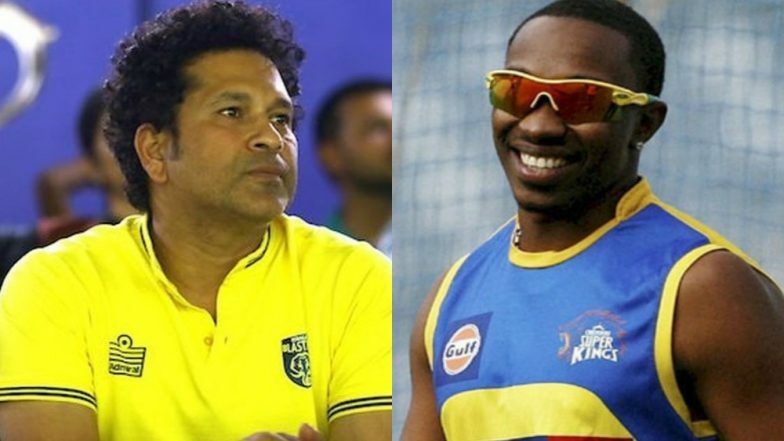 CSK’s Dwayne Bravo Turns a 'Dulha' Ahead of IPL 2019 (See Pics and Video). The former Windies cricketer already has a hit number 'Champion’ against his name. Meanwhile, legendary Indian cricketer, Sachin Tendulkar took to Twitter and in a video message wished Bravo good luck for his new song. Tendulkar also requested to the Chennai Super Kings (CSK) all-rounder to release the song quickly. “DJ Bravo, my friend. I am looking forward to your new song called Asia. When are you releasing it? Do it quickly man, I am looking forward to it. Good luck!” said Tendulkar in the video. IPL 2019 Schedule in PDF for All Matches: Download VIVO Indian Premier League 12 Full Timetable With Fixtures, Dates, Team and Venue Details. Bravo, who retired from international cricket last year, is an integral part of CSK squad. In the IPL, Bravo has previously represented Mumbai Indians and played under Tendulkar’s leadership. He was also part of the now discarded Gujarat Lions. Aata Kya Khandala? Aamir Khan Responds To Sachin Tendulkar's Birthday Wish In Style! Read Tweet. The 35-year-old from Trinidad made his IPL debut in 2008 edition. He has since then played 122 IPL matches and has scored 1379 runs, which includes five half-centuries. Bravo has picked 136 wickets as well. Bravo bats in the lower middle-order and apart from the big hitting abilities he is known as death-over bowling specialist.